Bethzaida Campos thought she had found the perfect place to rent when she saw an ad on Craigslist. "I thought it was a great deal because nowadays renting is super expensive," Campos said. The two-bedroom apartment was supposed to include everything for $800 a month. The young mother, who lives paycheck to paycheck, withdrew her entire savings to put down a deposit on the apartment to rent. One that she now admits was too good to be true. "I have a two-year-old and I thought it would be perfect," Campos said. That's when she first encountered the man who she says disappeared with her money: Julio Melero. "I told him that I liked it and I was interested," Campos said. "He told me don't think about it too much because I have another person coming already after you to come and look at the apartment." Campos didn't hesitate. She went to the bank and withdrew all her savings to pay the deposit, but didn't sign a contract or application. "He wrote me a deposit paper. He even wrote March 13 when I was supposed to move in," she said. "He even asked me if I still wanted the dog that he was offering to me. You know, it seemed so real." On move-in day, she arrived at the apartment with her belongings and her two-year-old son. But Melero was nowhere to be found. "There were no signs of him," Campos said. But others looking to move in were there. "Another person showed up, and then more people showed up. And it ended up being like a group of seven people looking for him regarding deposits and apartments they never were able to move into," she said. It was then that she realized she was out money and a home. UpdatedWhat is Fat Embolism Syndrome? "So many other worries, you know, my son. Where I'm supposed to go?" Campos said. 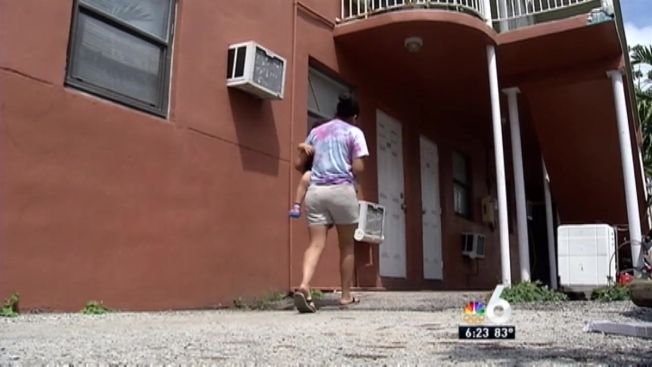 The young mother is one of seven people who called NBC6 Investigators with similar stories claiming that they gave Melero a deposit for the same place. The Miami-Dade Police Department says it found over a dozen similar complaints and is now investigating. "The common factor in all these victims is that he would ask for a deposit and then he would tell them, once they gave the deposit, he would say, come back, so I can give you the key and, of course, when they came back, he was nowhere to be found," said Det. Alvaro Zabaleta, a spokesperson for Miami-Dade Police. Melero has been in trouble before, records show. In 2011, he was convicted of fraud, identity theft and grand larceny for stealing thousands from his customers’ tax returns in Cape Coral. Melero declined to comment about the allegations pertaining to rental deposits. "I have nothing to say to you," Melero told NBC 6 Investigators Monday. Police said they would like to talk to Melero. "We still haven't made contact with him or located him as of yet. But we do want to talk to him. We want to talk to this individual because of the fact that we want to hear his side of the story," Zabaleta said. As for Campos, she had to scramble to find a place for her family to live. "I was able to manage and find a lease of an apartment for now," Campos said. "But it's hard because I don't have much." You should be suspicious if you are being pressured to give out a deposit without a contract and research the rental rates in the area. If what you're being offered is significantly lower, that could be a red flag.